Real moms share their yummy food discoveries: chicken BBQ and roast beef spreads! What breakfast do you usually prepare for kids? Cereal? Oatmeal? The traditional sinangag, sunny-side-up egg, and longganisa meal? These are all well and good, but preparing them takes effort. If you're rushing in the morning or just want to whip up a quick yummy bite for the little ones, you need an easy-to-make-but-oh-so-delicious starter snack, like breakfast sandwiches. They're so simple to prepare, you can also serve them for merienda. These five real moms have discovered how to prepare sandwiches as exciting baon and breakfast for their kiddos. It's all in the spread! The Greatest Love star Dimples Romana relishes simple moments like snack time with her two kids, Callie and Alonzo, when she's not busy taping for her teleserye. Kids need to keep their energy up, especially when playing sports. Mars co-host Camille Prats makes sure her son Nathan gets his energy boost by giving him a hearty roast beef sandwich. Give your child's baon a fun and healthy spin by tossing in some greens and playing with cute sandwich cuts. Look at how host Pia Guanio-Mago jazzed up her daughter Scarlet's chicken barbecue sandwich. Food blogger Peachy Adarne (www.thepeachkitchen.com) levels up her baon game with creamy versions of chicken and beef burgers. Count on "Rockstar Momma" Michelle Estranero (www.r0ckstarm0mma.com) to come up with cool ways to make the cutest sandwiches. These real moms prove that when it comes to breakfast and baon your kids will love, there's no need to get stuck in a rut. Keep things interesting for your little ones by giving them new flavors to savor, such as roast beef and chicken BBQ. Also, let them help with food prep so they feel involved and invested in making healthy food choices. It makes for an Instagram-worthy bonding moment, too! 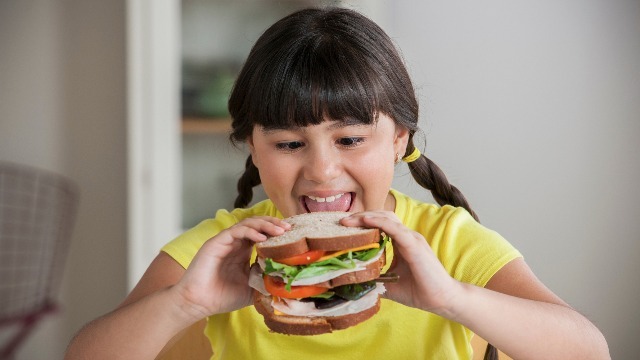 Get your kids started by whipping up yummy sandwiches. For easy recipes, visit www.ladyschoice.com.ph.